From the moment I turned the final page of Gwen Cooper’s New York Times bestseller, Homer’s Odyssey, I was hoping that Gwen would write another cat themed book. When I met Gwen back in September, and heard her read the first chapter of Love Saves the Day, I knew this book was something very special. A book like this doesn’t come along every day. Love Saves the Day is a novel written from three points of view. The primary narrator is Prudence, a brown tabby rescued from a deserted construction site on Manhattan’s Lower East Side. Prudence is a keen observer of humans and knows them better than they know themselves at times. “Humans best understand the truth of things if they come at it indirectly. Like how sometimes the best way to catch a mouse that’s right in front of you is to back up before you pounce.” You’ll find yourself smiling, and sometimes laughing out loud, at Prudence’s insight into human nature and astute descriptions of her world. From the “wonderful heated cat bed” in a place called “Home Office,” to Prudence’s dismissal of a self-cleaning litterbox (“It scared me so much that I started going on the living room rug just to avoid it“) Cooper’s love for cats and understanding of their nature and emotional lives, tempered with a sense of humor, is evident throughout the book. 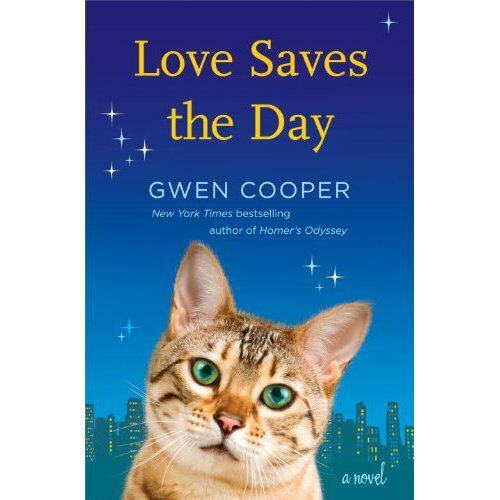 Loves Saves the Day begins when one day Sarah, Prudence’s human, doesn’t come home from work. Prudence’s world falls apart. For a few days, a neighbor feeds her, then Sarah’s daugher Laura, who hardly ever came to visit, arrives with her husband. They’re both carrying boxes. Suddenly, Prudence finds herself living in an unfamiliar apartment with two humans who she barely knows, and who don’t seem to understand cats. Prudence realizes that it could take years to train them in the way of cats. Prudence spends most of her days near the boxes with Sarah’s things in a spare bedroom in the new apartment, grieving for Sarah, trying to hang on to her memories and find comfort by being close to the things that still smell like Sarah. Meanwhile, Laura tries to push away anything that reminds her of her mother and her childhood spent in the midst of the Lower East Side music scene of the 1970s. Told from the three alternating points of view – Prudence’s, Laura’s and Sarah’s – the past of a troubled mother-daughter relationship is revealed, culminating in one defining moment that changes the trajectory of everyone’s lives. The best writers paint a picture with their words. In Love Saves the Day, Cooper masterfully paints a sweeping emotional landscape with a gentle, light touch. She effortlessly switches back and forth between the three different voices, but I think it’s a testament to how well she captured Prudence’s voice that I found myself thinking about how Prudence would tell even the parts of the story that are written from Laura or Sarah’s point of view. Cooper presents a lot of different topics in this novel: Prudence at the center of the book, the music scene of the 1970s in Lower Manhattan, the issue of what happens to pets whose guardians die, the real life event of a building on the Lower East Side that was demolished in 1998 and plays a pivotal role in the story, and a complicated mother daughter relationship that crosses several decades. Cooper weaves all of these threads into a beautiful, cohesive whole. Hauntingly beautiful, heart touching, and at times painfully raw, this is a story about grief, hope and healing. It’s a story about the importance of memories, and of preserving a part of one’s past. It is the story of a mother daughter relationship that shows that deep rifts can be mended even after death. But ultimately, this is a book about love, and how one small cat, through her mere presence, can change multiple lives. This book will stay with you long after you turn the final page. And it already makes me look forward to Gwen Cooper’s next book. 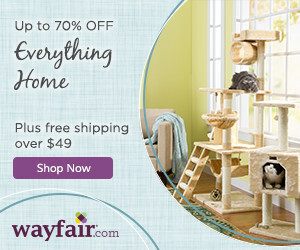 For more information about Gwen Cooper and her books (and cats,) please visit http://www.GwenCooper.com. Great Review.Pets definitely affect the lives of their human companions and vice-versa. Nice review. Gwen is a great writer so I’m sure it is a wonderful book. It does sound a touch sad (I often dwell on what my cats would experience if I died), but I hope that the other uplifting parts offset that sadness. Thanks, Julia. I think you’ll enjoy the book. That would be a wise choice on your human’s part, Texas. Aarrggh . . . ago . . .
I’m just finishing a novel for a review, and then I have to read my book club’s selection before Monday’s meeting. But after that I will immerse myself in the story . . . I can’t wait to hear what you think, Bobbi. Oh I just got this book yesterday. Now I can’t wait to start reading it. I loved Homer and looks like I am going to love this one too. Great great review. Take care and hugs to those two tortie girls. You’re going to love this book, Marg. Have a wonderful weekend – maybe reading the book!